Sorry... the 2017 Honda Pilot is no longer being sold as new. Instead, take the first step to a great deal on 2019 Honda Pilot with a free price quote! 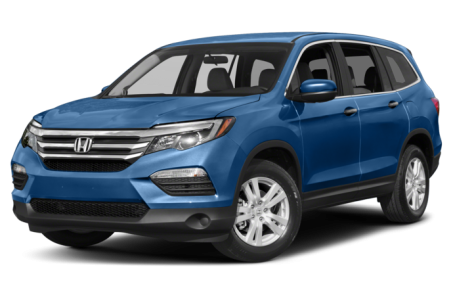 The 2017 Honda Pilot is a mid-size SUV that seats up to 8 passengers across 3 rows. It competes with the Ford Explorer, Dodge Durango, and Mazda CX-9. This year, it remains largely unchanged. Five trims are available: the LX, EX, EX-L, Touring, and Elite. Last year, the Pilot was completely redesigned, sharing many of its sleek design cues with the compact CR-V. The front grille blends in with the headlight clusters, forming a triangular crest shape. The lower fascia is slightly masked by the black-clad underbody trim. Available features include LED headlights, front fog lights, a power liftgate, roof rails, 20-inch alloy wheels, and a panoramic glass moonroof. Under the hood, the Pilot is powered by a standard 280-hp, 3.5-liter V-6 mated to a 6-speed automatic transmission. The Touring and Elite models receive a 9-speed automatic. Front-wheel drive comes standard, while all-wheel drive is optional. The V-6 engine features cylinder deactivation for increased efficiency, while the Touring and Elite models both also feature start/stop engine capability for added fuel economy. Inside, the Pilot’s second row can be configured with either a pair of captain’s chairs or a bench seat. The bench seat comes with a folding mechanism that operates with one button to give easy access to the third row. Standard features include push-button start, air conditioning, USB port, Bluetooth connectivity, and Apple CarPlay/Android Auto compatibility. Move up just one trim level to the EX however and it adds HondaLink infotainment with Pandora internet radio, an extra USB port, an improved 8-inch display screen, HomeLink remote, and tri-zone automatic climate control. Also available are heated/ventilated front seats, leather upholstery, navigation, acoustic glass for a quieter cabin, Blu-ray rear entertainment system, and remote engine start. You can also add a 115-volt outlet and two more USB ports in the rear to keep the whole family’s devices charged. The Pilot has a slew of available safety technology, including LaneWatch and Honda Sensing, which adds a collision mitigation braking system, forward collision warnings, lane departure warning, lane keeping assist, and adaptive cruise control. Standard safety features include a multi-angle rearview camera, antilock brakes, vehicle stability assist, and six airbags. 97 of 99 (97%) consumers said they would recommend this vehicle to a friend.